February 7th marked the fourth annual State of the Reserve held by the GTM NERR in St. Augustine, Florida. Titled 2014: Changing Tides, the event was hosted at the GTM Research Reserve Environmental Education Center and featured multiple presentations as well as poster displays of current professional and student research within the reserve. Opening remarks and introductions were made by program facilitator Tina Gordon and environmental administrator Mike Shirley. The focus of this year’s meeting centered around rising sea level due to climate change, changes in water quality, and shifts in habitat and species’ health. Presentations included subjects such as current surveys of Carolina diamondback terrapins in the NERR, mangrove expansion into salt marsh habitats, and the efficacy of coastal restoration projects in science and education. The research center also presented updates on the current state of its programs and facilities as well as future outreach and education goals within the community. More information about the reserve can be found on their website. The project’s sixth Steering Committee meeting was held on December 9, 2013 at the GTM NERR Marineland Office. The project’s Collaboration Lead, Dr. Dawn Jourdan, presented a draft presentation for the next stakeholder workshop to be held February 24, 2014. The presentation included the information that the project team learned from the first stakeholder workshops in Fall 2012 and Spring 2013, as well as new results from the project’s technical analyses of future land use and habitat conservation design. The team was fortunate to have UF researchers Dr. Paul Zwick and Dr. Tom Hoctor on hand to answer questions. Overall, the meeting was very productive and the Steering Committee members provided valuable feedback on analytic inputs and how to communicate the technical results to the public. 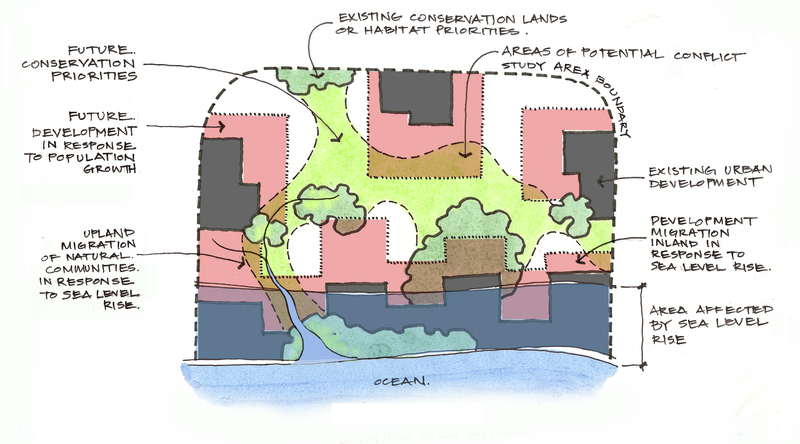 Conceptual sketch presented at the meeting, illustrating the project team’s technical analyses of future land use and habitat conservation design with adaptation to sea level rise. This month’s Landscape Architecture Magazine features the Planning Matanzas project in “Think or Swim,” by Jonathan Lerner. Some of you may remember Lerner, who attended our Spring 2013 professional stakeholder workshops. In his exposition of our project, Lerner does a wonderful job of capturing the unique and vulnerable beauty of the Matanzas Basin as well as the complexity of the planning task at hand. Click on this image to view a PDF of the article. The article includes some of our project’s SLAMM maps and Lerner provides a good explanation of how these maps give useful information for planning. He covers the challenges with predicting sea level rise impacts, including the need for a diverse group of individuals working together on this effort. The article closes with Lerner’s experience traveling around the Basin with Ed Montgomery, a member of our steering committee and director of real estate marketing and sales at Rayonier. He reflects on the issue of habitat conservation given the anticipated migration of natural systems and human systems. As Dr. Dawn Jourdan explains at the article’s conclusion, our project is about providing information and education to the community. It will ultimately be up to the local decision-makers, leaders, and residents to decide which planning course they would like to chart. Landscape Architecture Magazine is the monthly magazine for the American Society of Landscape Architects. The magazine, which has a readership of 60,000, features planning and design projects across North America. View the November 2013 issue of Landscape Architecture Magazine here. As we’ve been examining the potential impacts of sea level rise in and around the Matanzas Basin, Ann Horowitz has been examining the potential impacts of sea level rise on historic St. Augustine. Horowitz recently connected with our project to share her findings. 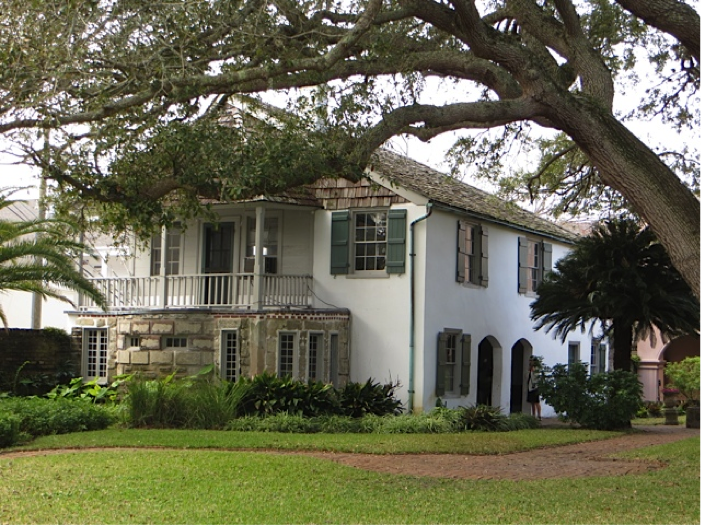 Specifically, Horowitz explored the effects of sea level rise on St. Augustine’s National Register historic districts and the need for adaptation as part of her historic preservation master’s thesis for Goucher College, near Baltimore, Maryland. She found that the impacts of sea level rise could significantly compromise the future of St. Augustine’s unique architectural and cultural heritage by 2100. 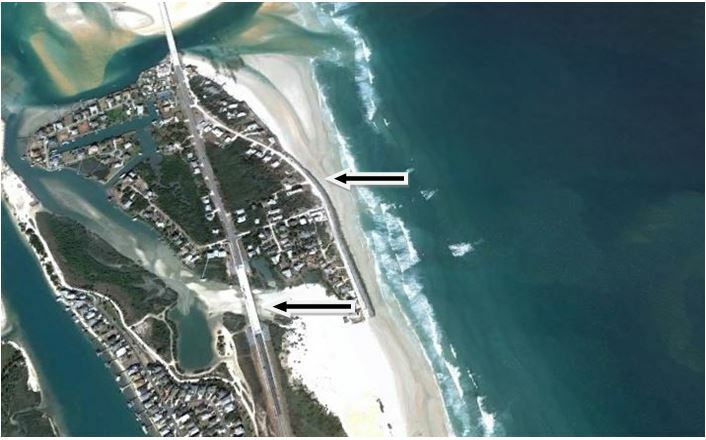 As Horowitz describes in her study, St. Augustine is no stranger to coastal adaptation. As early as 1599, the Spanish recognized the need for protection after a severe ocean storm damaged the early settlement. St. Augustine’s first seawall was constructed of timber between 1596 and 1602. 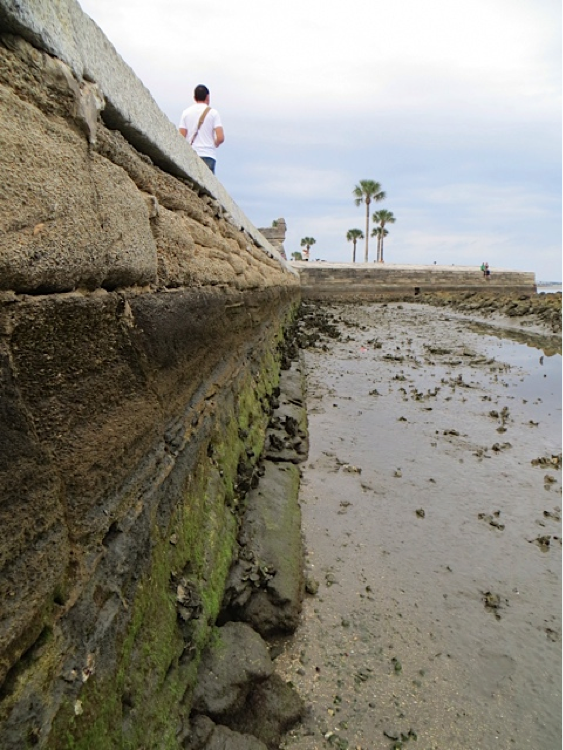 Two coquina stone seawalls followed: Spain financed the first seawall completed in 1705 while the U.S. engineered the second between 1836 and 1842. (Fig. 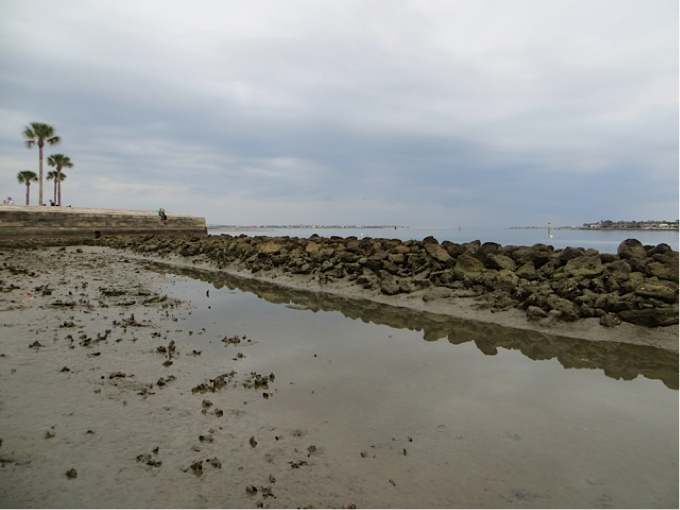 1) The National Park Service constructed a rip-rap living seawall in 2011 to protect the nineteenth century historic seawall adjacent to the Castillo de San Marcos. (Fig. 2) In addition, the new Avenida Menendez seawall rehabilitates and protects the historic seawall between St. Francis Street to the Santa Marina Restaurant. With a sea level rise projection of one foot by 2050, the shoreline could migrate closer to the historic district boundaries, increasing the probability of damaging floods, storm surge, and coastal erosion. 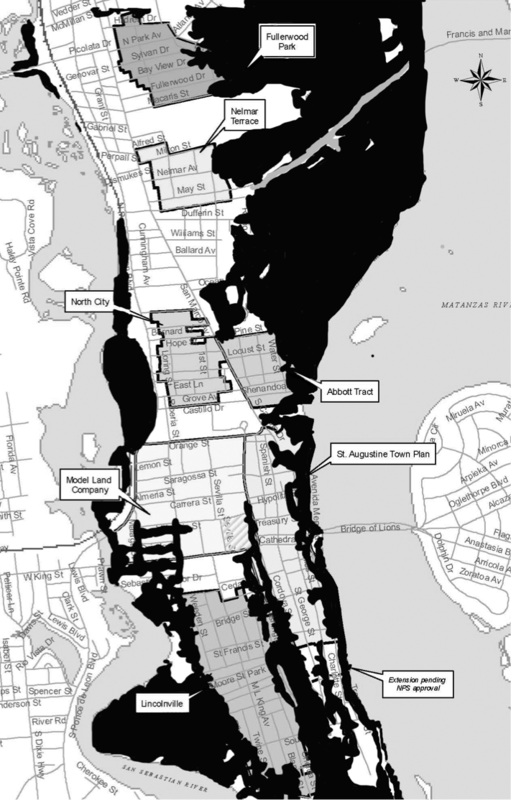 A projected three-foot sea level rise by 2100 may permanently inundate portions of six St. Augustine historic districts. (Fig. 3) More frequent floods, higher storm surges, wetlands migration, and coastal erosion could impact all seven districts, resulting in the degradation or demolition of irreplaceable historic properties. For example, wetlands could migrate into the Lincolnville Historic District, potentially undermining the foundations of many historic buildings, leading to their collapse. Furthermore, coquina stone and tabby are vulnerable to erosion and disintegration. (Fig. 4) Many of St. Augustine’s oldest historic buildings and structures are constructed with these lime-based building materials. Due to rising carbon emissions, the increasing acidity of ocean and rain water causes the dissolution of lime-based substances. Historic properties of coquina and tabby, such as the Castillo de San Marcos and the “Oldest House,” will eventually decompose if permanently inundated in acidic floodwater (Fig. 5). 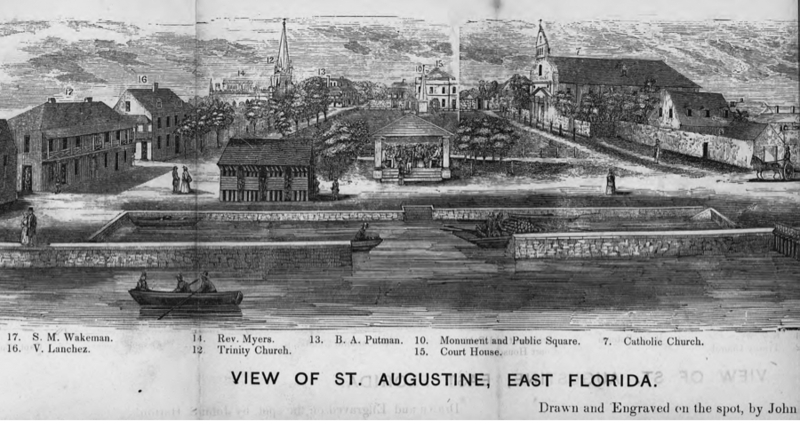 In her thesis, Horowitz provides a sobering image of St. Augustine’s future due to the tremendous loss of historic properties that reflect the city’s rich cultural legacy. Adaptation solutions, such as the Avenida Menendez seawall and the city’s recent stormwater improvements, will minimize the effects of sea level rise on the historic districts. Nonetheless, additional adaptation strategies based on sea level rise projections are needed to further protect historic St. Augustine’s distinctive architectural and cultural heritage, critical to maintaining the city’s economic and social vitality. Interested in learning more about sea level rise impacts on St. Augustine’s historic districts and adaptation? See Horowitz’s link to her thesis abstract and chapter on St Augustine here. For additional information on National Register historic district vulnerabilities to sea level rise and adaptation solutions, contact Ann Horowitz at annhorowitz@me.com or (703) 629-5343. 1. Accommodation – Accommodation strategies adapt to rising water levels through design measures such as elevating infrastructure or implementing stormwater improvements. Although they do not prevent flooding or inundation, they can be suitable for location-dependent structures. Elevating residential homes is an example of an accommodation strategy used along the coast in the Matanzas Basin area. 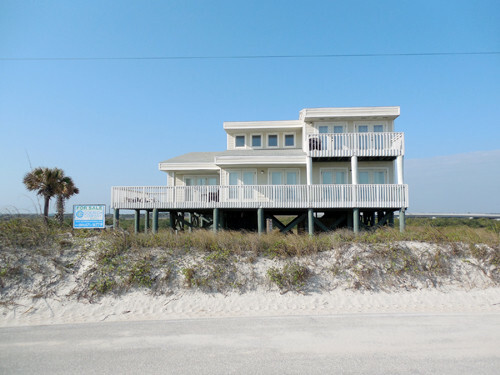 An elevated residential home on A1A in St. Augustine, FL. 2. Protection – Protection strategies mitigate the impacts of rising seas through defensive mechanisms. Armoring is a “hard” protection strategy that is used often in historically significant areas. 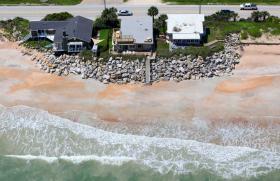 For instance, seawalls are used in St. Augustine to protect its historic downtown. Beach renourishment is a “soft” protection strategy that is used by coastal communities to decrease vulnerability. Riprap along A1A, in Vilano Beach. Courtesy of Daron Dean at the St. Augustine Record. 3. Planned Relocation – Planned relocation involves the actual movement of development and infrastructure away from high risk areas. Prompting a relocation includes acquisition of vulnerable areas to prevent future development. Acquisition can occur through transfer of development rights, rollings easements, or conservation easements. St. Augustine witnessed the retreat of infrastructure with the rerouting of A1A Beach Blvd due to increased flooding and inundation. The arrows indicate the locations of the new and old A1A in Summer Haven, FL. When sea level rise accelerates, who will it impact the most? The next generation of planners, government officials, residents, and business owners may be young right now, but the importance of informing them and getting them engaged with the issue was not lost on the Matanzas sea level rise project team and steering committee. 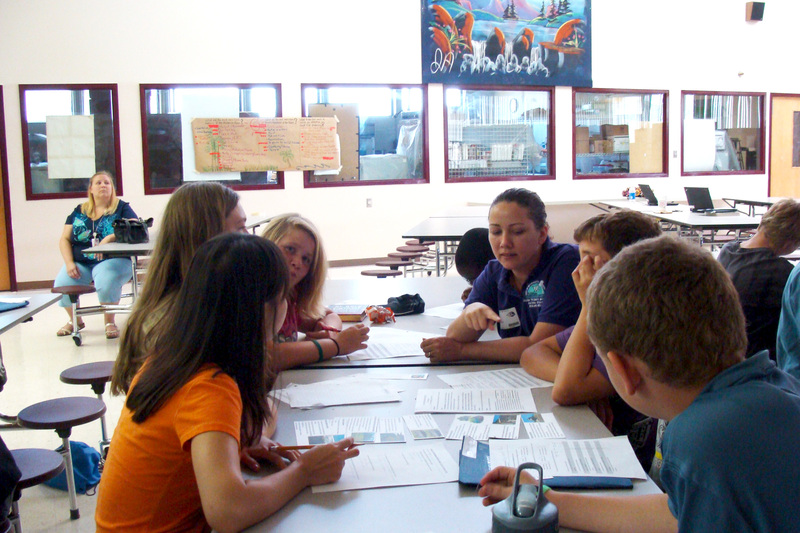 As with the college and high school student workshops in May, we recently engaged middle school students participating in the summer program at St. Johns Technical High School in St. Augustine to teach them about sea level rise, and to find out what they thought about the issue and what they value in their community. GTM Research Reserve’s Coastal Training Program Coordinator, Tina Gordon, coordinated with teachers and administrators at St. Johns Technical High School to offer a sea level rise workshop to about 40 students in grades 6-8. 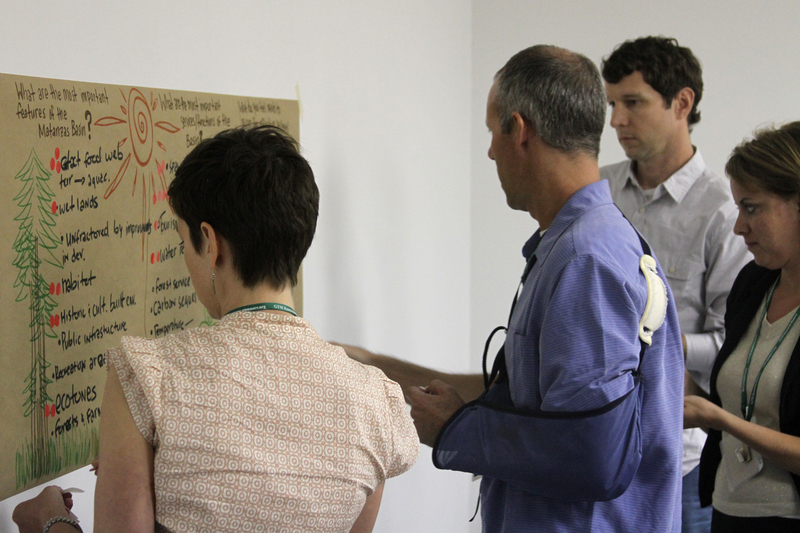 The workshop was structured like the previous adult community and professional group formats. The content of the presentations, visioning, and role-play game remained the same, but it was re-worked to meet the curriculum level of the students. 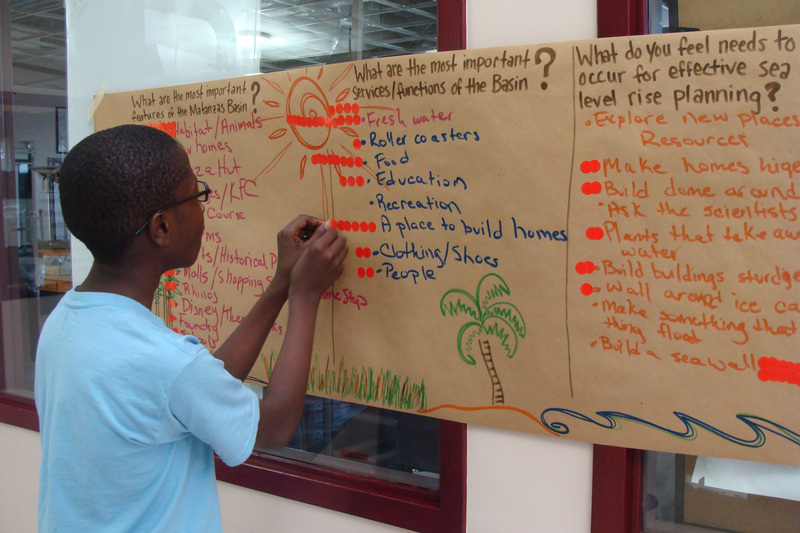 The middle school students were most excited by the visioning exercise in which they told us what places and features were important, what services were important, and what they would do to plan for sea level rise. The students were also a great help in making suggestions to the team on future sea level rise education for their age group, including having students draw pictures of their communities and adaptation strategies. Like other youth participants in our workshops, the middle school students leaned more towards protection of places they loved through fortification such as sea walls than adults (who more often considered planned relocation), and the students desired to keep natural areas natural. The team will incorporate this input into the overall project, Planning for Sea Level Rise in the Matanzas Basin. The project team would like to thank Linda Krepp and Wayne King for enabling their students’ participation, all of the teachers who assisted in our group activities, and the UF graduate students who facilitated the interactive activities. A student ranks the most important features of the Matanzas Basin and the needs for effective sea level rise planning. Students play the adaptive strategy game with GTM Research Reserve Coastal Training Program Coordinator, Tina Gordon. The third, and last, professional stakeholder workshop of this series was held on June 4th, 2013, in Marineland, FL. Nine participants with backgrounds in development, real estate, and business were welcomed by Micheal Shirley, Director of the GTM Research Reserve. The University of Florida project team then presented participants with an analysis of potential sea level rise impacts to the Matanzas Basin, and a primer on adaptation planning. Afterwards, participants provided input towards future planning scenarios through a visioning exercise and a sea level rise adaption strategy role-play game. 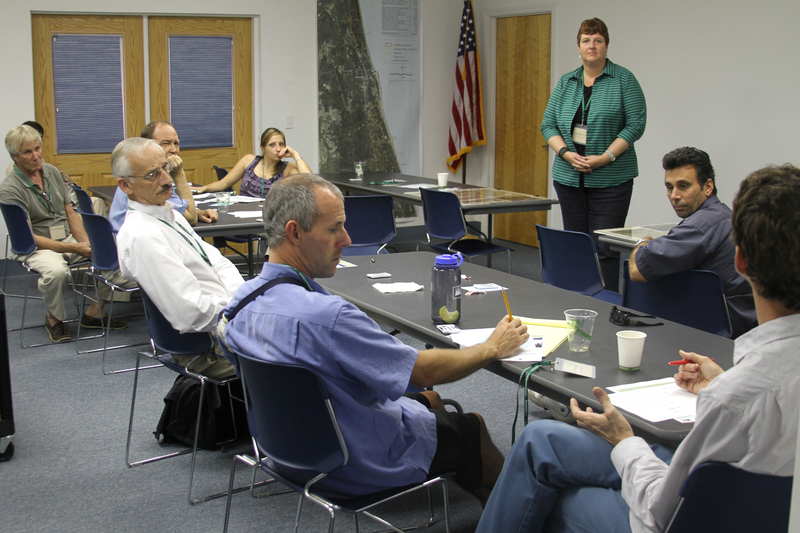 The workshop provided an excellent forum to discuss ways to ensure the Matanzas area’s continued vitality. The project team thanks participants for a productive workshop and engaging conversations. The input provided by participants will inform the next phase of the project that generates maps of future land use scenarios. These maps will be shared with all stakeholder groups and citizens in late fall of 2013. Doug Davis (far right) discusses his group’s results from the sea level rise adaptation strategy game. Workshop participants identified their top priorities from the visioning exercise by placing a red dot by their preferences.